Yesterday I took to work a gym bag packed with contingency plans. Plan A was to go for a run at lunch; plan B was to head to Melissa’s 6pm spin class, if it was too rainy at lunch. Plan C was to attend a work-related happy hour, bag the whole cardio thing, then go to yoga class again for the third time in 3 days. Lotus-like tulips: gifts to my yard from Mom, last year. I ended up getting out for a run at 3pm, and loving every minute of it, in the sun, along the still-bloated but receding Mississippi River. Runs during the work day at this time of year are particularly satisfying: I’m still on the early part of my race training calendar, so the runs can be shorter, on the pavement right outside my door, and at an easier pace. They fit nicely into the one hour I’ll allow myself to be away from my desk. What I ended up doing, was Option (not Plan) D. I’d started writing this post, thinking about how much planning I do in order to cope with circumstances that seem beyond my control. At times it seems ridiculous, both in terms of how many bags of clothing and gear I pile into the car, and in terms of how much energy and anxiety I put into the planning. The panoply of circumstances can sometimes break my focus, and I’ll start worrying about the needs that may not be met over the course of a week, depending on those circumstances. Am I on track, for race training? Am I keeping cholesterol at bay? Do my clothes still fit right? Am I fulfilling my weekly need for joy-in-motion? And those are just the anxieties that relate to exercise. I decided to stick to my guns about a run, even though the noon plan didn’t work out. A run was what I wanted and needed to do, yesterday. Several of my recent posts have been explorations of the Yamas and Niyamas. I am surprised to find, that this post relates to the Niyama Tapas: burning discipline, very simply put. While I think it specifically refers to discipline with living a yogic life, it’s also more expansive. It’s about making all of your decisions with your grander goal in mind. My grander goal is to live true to who I am. I’m more about love, joy in movement, and appreciating being outdoors, and not so much about competition and adrenaline, though in the past those have factored into my plans. So, I’ve made some changes in my near-future plans. This summer, I have decided to run in just two races, rather than the four or five that I often end up doing in a summer. I’ve canceled my indoor rock climbing gym membership, and plan to climb outside a little more. Yesterday I ran. And soon, I’ll be teaching some yoga. How the photo relates to this? 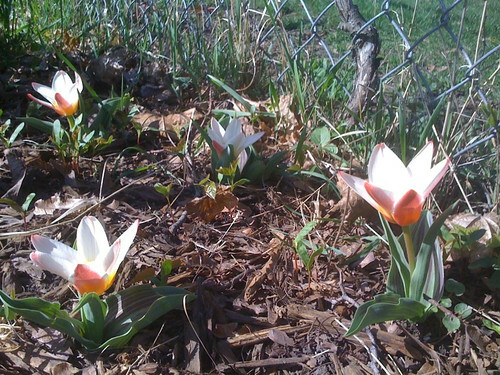 It’s maybe a stretch, but those tulips, brand new to our yard this spring, look like lotus flowers. I don’t know why they are so short! Nonetheless, the lotus flower often represents spiritual awakening. In fact, the “thousand-petaled lotus” is the name of the crown chakra, the seat of enlightenment. I may not yet feel spiritually awakened, but observing Tapas will help me get there.